YOU CAN ALSO CLICK ON THE LINK BELOW FOR OUR WEBSITE. I have never been so excited to be a part of such a great community art festival! I was given the honors to work along a great committee to make this happen for our Cultura. 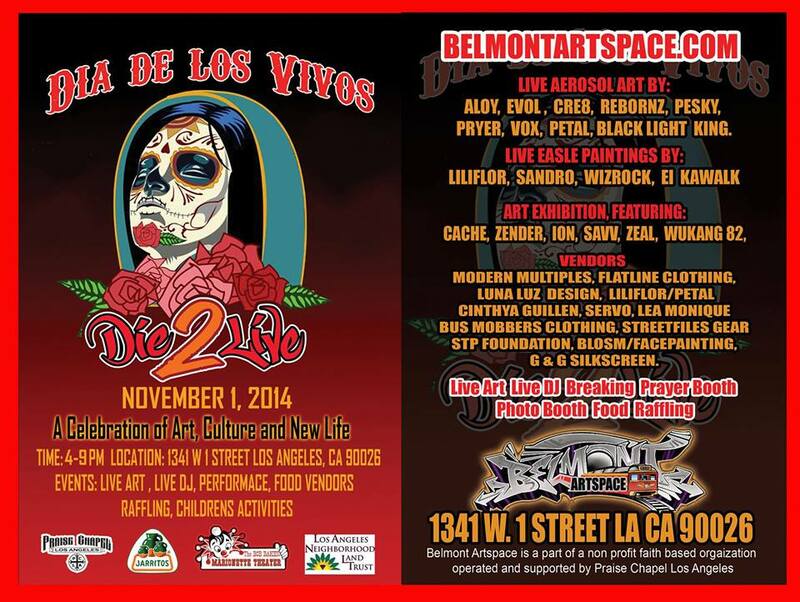 Dia De Los Vivos at the Belmont Artspace which is located right across the street from Legendary Belmont Tunnel, which was the original stomp grounds for the 1980’s generation of Graffiti Artists on the West Coast. We are all really looking forward to this Community Event which will mark yet another great memory to our Belmont Artspace! We will be having live DJ’s, Live Graffiti Artists, Easel Artists, Food Vendors, Art and clothing vendors as well. Zender is also holding an exquisite art exhibit thematically as Day of the Dead and our Hispanic Culture. Aside to Blosm s face painting, children’s activities, bouncers and raffles throughout the event. We have partnered with Bob Baker Marionette Theater and they will open up their doors and entertain the public with an awesome marionette show! You cannot miss on the great activities we have in store for our Los Angeles community.